DHARAMSALA: The Sikyong and the Central Tibetan Administration (CTA) welcome President Barack Obama’s nomination of Senator John Kerry as his next Secretary of State. 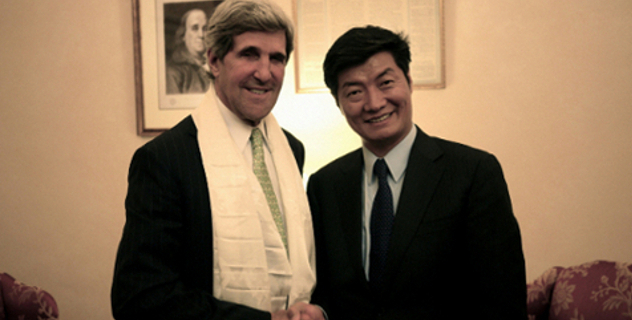 “Senator Kerry is a long term friend of Tibet and brings extensive foreign policy credentials. He has a deep understanding of the Tibet issue. I wish him a speedy confirmation and much success in his new role as the next United States Secretary of State. I hope he’ll build on the efforts of Secretary Hillary Clinton, elevate the Tibet issue and human rights as American foreign policy pivots to Asia, and fully implement the Tibetan Policy Act,” said Sikyong Dr. Lobsang Sangay. Senator Kerry has served in the United States Senate for twenty-eight years, and has been the Chairman of the Senate Foreign Relations Committee since 2009. He is an expert on American foreign policy, and is highly respected amongst his colleagues and internationally. Senator Kerry has a long record of support for Tibet, and helped steer two Tibet resolutions in the Senate in 2012 alone including one in March where under his Chairmanship of the Senate Foreign Relations Committee, the Senate passed a resolution expressing support for the people of Tibet and calling on the Chinese government to end its repressive policies towards Tibetans. He was also one of four senators who wrote a letter to President George Bush on May 9, 2008 calling on the Bush administration to take specific actions to help resolve the crisis in Tibet, including making a presidential visit to Tibet during the Beijing Olympics, establishing a consulate in Lhasa and calling for expanded access to the region for international humanitarian officials and journalists. The Secretary of State-designate has met with His Holiness the Dalai Lama on several occasions and with Sikyong Dr. Lobsang Sangay twice. In their most recent meeting in July 2012 in Washington, DC, Senator Kerry and the Sikyong met at length talking about both the current crisis in Tibet and lighter subjects such as various things they had in common. They are both residents of the state of Massachusetts, Harvard University alums, and passionate Red Sox fans. The Sikyong and CTA congratulates Senator John Kerry on a well-deserved nomination and looks forward to his continued support of Tibet and the Tibetan people in his new role as the next United States Secretary of State.